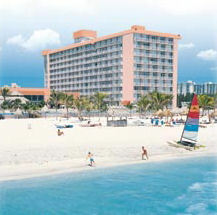 Newport Beachside Resort is a Miami Beach hotel that offers comfortable rooms and luxury suites from $79 per night. Many of our rooms include private balconies with spectacular views of the Atlantic Ocean. Room service, valet/laundry, wireless internet access, in-room movies, and a concierge are examples of how we make your private guest room comfortable and convenient. When you emerge from your sanctuary, our hotel amenities will keep everyone in the group happy and entertained. The conveniences and activities include an oceanside swimming pool, a fishing pier, a game room and arcade, a full service salon and spa, a business center, valet parking, an exercise room, and child care. Ideally located in the Sunny Isles Beach area, we’re just 15 minutes from downtown Miami. Visit our site and see our specials and packages throughout the year. Online booking is also available.